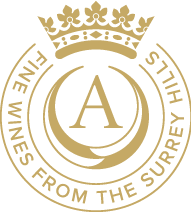 Join us for a guided tour of the vineyard overlooking the beautiful Surrey Hills, learn about the rise of the English wine scene, and gain an insight into our passion for organic viticulture and top quality wine. Return to the vineyard patio for a tasting of our award-winning wines. £5 of your booking fee is redeemable against sparkling wine bottles bought on the day. Want to buy a tour and tasting experience as a gift? Try our tour and tasting voucher, the perfect present for wine lovers! Tours last between 1.5 and 2 hours. Most of the tour takes place outside on the vineyard so please wear suitable footwear and wet weather clothing if necessary. Tours run between May and September each year. We are unable to offer refunds on tours but if you are no longer able to attend, let us know as we may have a waiting list.